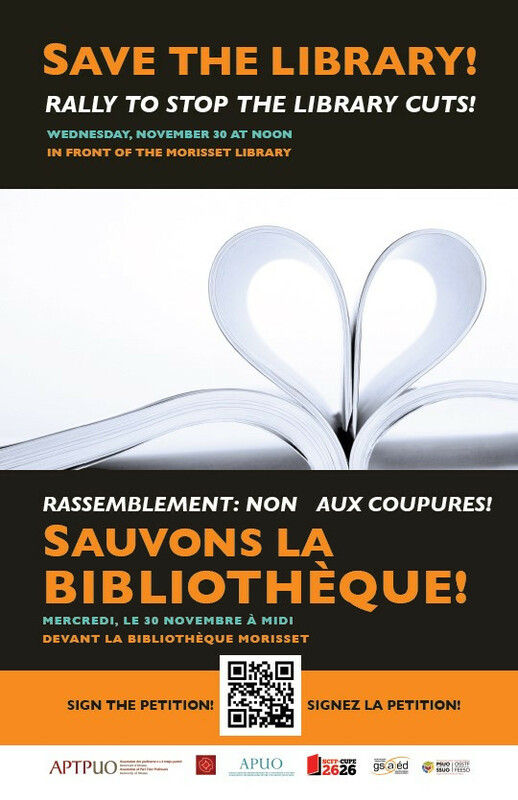 PRESS RELEASE: University of Ottawa library on the chopping block: rally to stop the cuts! OTTAWA – University of Ottawa library on the chopping block: rally to stop the cuts! The University of Ottawa is planning to cut almost $2 million from the library budget of 2016-2017. The proposed cuts are a source of serious worry for students, faculty, librarians, university staff, members of the Senate, and members of the University Board of Governors. In the context of rising tuition fees, library cuts are a hard blow to students who rely on library materials to complete assignments, as well as to faculty who require up to date research materials to teach and conduct research. The proposed cuts not only undermine the primary mission of the university as an educational institution, but fail to resolve broader challenges of balancing budget shortfalls without compromising the quality of education. The announcement of these cuts is taking place within the broader context of the commercialisation of knowledge and increased pricing that affects all academic institutions. In particular, Canadian universities are threatened by price-gouging of major publishing houses. The cuts of up to $2 million represent less than 3% of the administration’s billion dollar budget. Historically, university budgets have fluctuated up to 3% in accordance with the University’s needs. A petition of over 3500 signatures is calling on the university administration to reverse the cuts. The Faculty of Social Sciences and the Faculty of Science as well as the Senate of the university have passed motions to reverse the cuts. Members from seven campus based unions representing students, faculty, librarians and staff will be protesting the cuts and calling on the administration to make the right decision and reverse these cuts, which will compromise the quality of education and have a negative impact on our ability to maintain research excellence at the University of Ottawa. Budget are about priorities. In searching for solutions, the university administration must prioritize the quality of education and our ability to pursue research in the public interest. Student, staff and faculty associations on campus are organizing a rally to stop the cuts on Wednesday, November 30, noon, in front of Morisset Library. Supported by APUO, GSAÉD, CUPE 2626, APTPUO, SFUO, SSUO, SEIU local 2. For more information please contact Maria-Hélèna Pacelli, Communications Officer apuoco@uottawa.ca or (613) 230-3659. Rally to stop the library cuts! The University of Ottawa is planning to cut almost $2 million from the library budget. This is a serious concern for students, faculty and the University of Ottawa community. Members from seven campus based unions representing students, faculty and staff will be protesting the cuts and calling on the administration to reverse this decision. Please find enclosed a printable version of the “Save the library” poster. What: Rally to stop the library cuts! Where: Student square, in front of the Morisset Library – followed by a march to Tabaret Hall, University of Ottawa. Please find enclosed an open letter from APUO to University of Ottawa President Jacques Frémont demanding that the cuts be reversed. This message was sent to APUO members on November 24, 2016. To see the original message click here.